Stumbled across a blog called Triumph Flat Track which as the name suggests is all about everything Triumph from vintage photos through to modern bike builds. 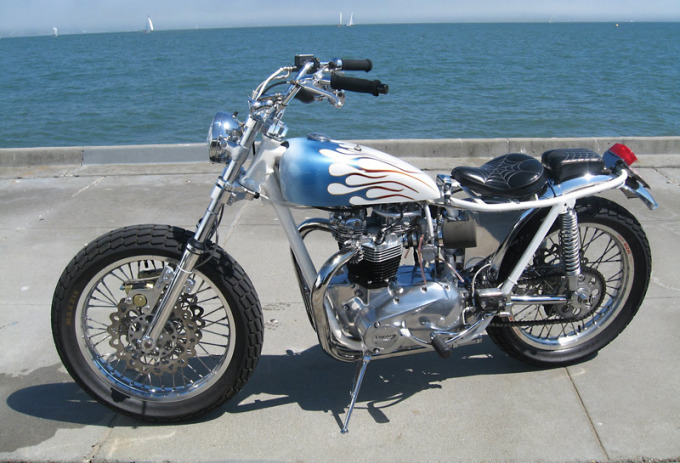 Like this cool 1966 Triumph TT with the very retro looking leather spider seat and flame tank. Greg Rovetta is the bikes owner and said this about the build: “The mastermind for this build is my friend “Steve Perez”, with me doing the slave labor. I bought it in 1984. This was the 3rd ground-up rebuild. The frame and casings were in pieces in his back yard for over ten years. I was then reunited with my frame after not seeing my friend for ten years and slowly built it into what it is today.” For more specs and pics hit this link to Triumph Flat Track.